Xplore’s pharma melt extruder (PME 5) is a GMP compliant high quality instrument for Hot Melt Extrusion (HME). 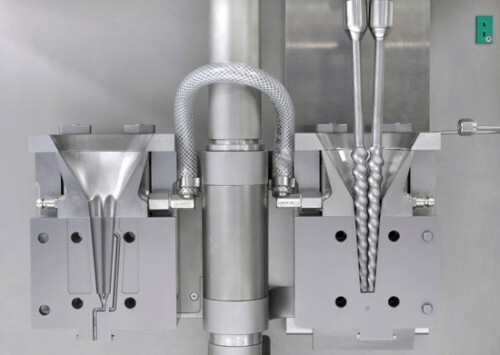 Engineered for speed, flexibility and cost-effectiveness, the PME 5 has a standard volume of 5 ml, but also offers a 2 ml* barrel liner for twin-screw extrusion of a minimum amount of product (PME 2, see image below) to meet the demanding screening requirements of pharmaceutical and biomedical R&D applications. Interchangeable barrel liners – for 5 or 2 ml working volume (other volumes on request, see 2 ml barrel liner image ). Interchangeable screws – conical, fully intermeshing, co-rotating for optimum mixing. Easy-to-remove barrel liners and screws- for quick and thorough cleaning. Faster screening by cleaning screws and barrel liners in parallel during the next experiment. Water cooled top hopper and extended forced feeding screws – for easy feeding of fluffy or static powders. High melt torques possible (19 Nm/screw) for low temperature extrusion and minimal degradation risk. Divisible, detachable outlet cap – with 2.4 mm die, also compatible with fibre and film device. Dedicated software – for rheological and process data. Protocol for easy upscaling to parallel twin-screw extruders. Optional extras – to fully meet your specific requirements.